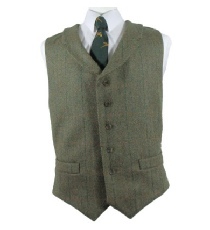 A high quality handmade two pocket tweed waistcoat with lapels. These waistcoats were made by Beaver of Bolton for one of its retailers and carry a label other than Beaver of Bolton and for that reason they are available at less that half the RRP. They are made to the usual exacting standards for which Beaver of Bolton are renowned.